Hail damage repair is never a situation we plan for. 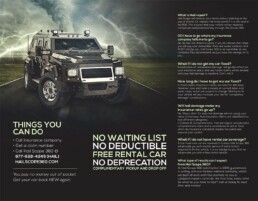 From having to make phone calls, to meeting an adjuster, to just not having time for any madness. Hail Scope 360 can manage your claim, to allow you to get back to your life. We look at every detail of your claim, to ensure your insurance company got everything on the estimate. 99% of the cars we repair we catch something the insurance didn’t. Insurance companies look at cars outside all the time in natural light that hides half the damage on a vehicle. If it seems they wrote you claim to low, they probably did, but do not worry. 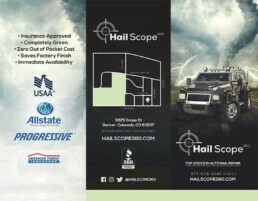 Hail Scope 360 looks at every vehicle in a controlled environment, with industry standard lights that will pick out every dent and low on a panel. We have traveled globally for 20 years and have been at the fore-front of the repair industry. We are experts at our craft, and guarantee our repair will surpass any questions about quality. Our technicians have 15 + years experience and have been picked by our Staff. Hail Scope 360 has great references and reviews online. We are here to help you and get your car back to pre-hail condition! We work with all major insurance providers to provide excellent customer service.